Glad you could make it… a great weekend of solidarity and unity of purpose highlighted by speeches by Francis O’Grady and Jeremy Corbyn calling on us to continue our mass challenge to austerity, the trade union bill, cuts in public services, zero-hour contracts, and fracking. Thanks to all comrades, from the district and beyond who helped out with banners, working on the stalls, handing out literature and, of course, The Morning Star. Especially glad to see Gloria resplendent in red jacket and trousers, an inspiration to us all. 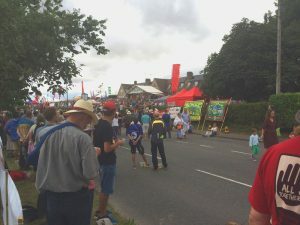 Listening to Jeremy Corbyn following the procession on Sunday afternoon, the crowd spread out from the Martyrs museum field and across the old A35. We drink barrels of beer and feel great! And big comradely huggin’ as well! 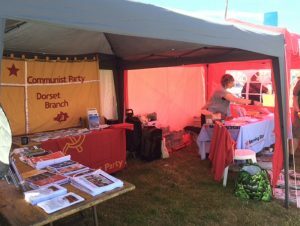 Be the first to comment on "Tolpuddle Festival 2017"